There’s always one child who winds up being the caretaker. Often it’s the daughter with no children of her own who the rest of the family seems to gravitate to. In this family that child was Mary Ann. Mary Anne Walder Brown was born about 1825, presumably in Sussex, England. I have not yet found a birth or christening record for her . She uses the name Mary A. or Mary A.W. throughout life, and her will provided the name Walder. She arrived with her family in New York on 11 Apr 1835, and I can account for her (based on age) on the 1840 census. In about 1845, Mary Anne married Robert William Pringle (abt 1825-1895). More on him and the Pringles in a bit. -1855 – NY census, her mother Elizabeth is residing with her. -1865 – NY census, her mother, brother James and nephew Wm are living with her. -1870 – Fed. census, it’s just her and Robert – who is listed as out to sea. -1875 – NY census, her nephew William Brown b.1858 Kings NY is living with them. -1880 – Fed. census, Hugh and Thomas Nevin are residing with them but are not relation. -1892 – Thomas Nevin is still residing with them. -1895 – 7 Feb husband Robert died. Mary Anne died 11 April 1904. She was interred in Green-Wood Cemetery with her husband in Lot 27263, Sec 135. Her will was written on 3 Oct 1901, but wasn’t proven until 16 Nov 1904. She names her niece Ruth Reed (daughter of sister Frances), niece Hattie Knox (daughter of brother Edward), brother Edward Brown, and sister-in-law Eliza Pringle in her will. Let’s talk about the damn Pringles for a minute. I will generally look at a spouse and attempt to determine who their parents were. In this case, that turned into a bit of an exercise in confusion. On the 1900 Census, Elizabeth Pringle and Charlotte McEndow are both listed as sister-in-laws to the head of household Mary Anne, indicating they are both sisters of Robert W. Pringle. I went in search of what I presumed were the Pringle sisters. Eliza Pringle’s 1906 death certificate stated she was born in 1821 in Ireland, the daughter of Hamilton Pringle and Jane McEndon [sic]. Charlotte McEndow’s 1907 death certificate states she was born in 1827 in Ireland, the daughter of James Pringle and Ann Montgomery. I noticed they were both buried in Green-Wood cemetery so I checked plot records. Charlotte is buried with her son Joseph Hamilton McEndow (1863-1888). Eliza is buried with Margaret P. Bryan (1822-1897) and her husband. Margaret’s death certificate states she was born in 1822 in Ireland, the daughter of Hamilton Pringle and Jane McEndow. To complicate matters further, buried with Mary Anne and Robert is William Thomas Pringle (1840-1893) who was born in England, son of James and Elizabeth Pringle. I found three Pringle girls arriving in New York on 18 Sep 1839 – Margaret b.1821, Eliza b. 1823, and Charlotte b. 1826. My second Brown sibling who drove me to distraction was Edward. He was born 6 Oct 1819 in Suffolk, England, and arrived in 1835 with his family. His birth date came from his obituary;1 I have not yet located a birth or christening record for him. He married Ann Burnett (1819-2 Jun 1897) on 1 Jun 1839 (date and maiden name from his obit). Several trees state that Ann’s parents were William and Rachel (Durrant) Burnett, but I’ve found no real evidence of that. There are numerous Ann Burnetts born 1819-1820 in England. I’ll check the image of her death record when in Salt Lake City to see if it provides any other information, but until someone comes up with a definitive record from New York, I’ll leave that block empty. The Edward Brown family pulled a great disappearing act. I could not locate Edward between the 1835 passenger list and the 1900 Census.2 I could not locate his son Edward A. after 1868 when he signed his grandmother’s death certificate. There were death dates for Edward and Ann on several online trees and, as usual, not a single damn source for the information. Using the dates online, I went in search of death records and obituaries. I first found Ann’s death record and a death notice, but it provides no help with her parents.3 Ann (Burnett) Brown was interred on 5 Jun 1897 in Cypress Hills Cemetery in Sec 4, Lot 605, grave 4. The plot was owned by John Mason, father-in-law of Ann’s daughter Elizabeth (Brown) Mason. In the end it really only took two records to open up the Edward Brown family for me. First: Edward’s 1906 obituary. At the time of his death, Edward was living with his daughter Elizabeth Mason (born in Canada)- she was the only child that I knew at the time. 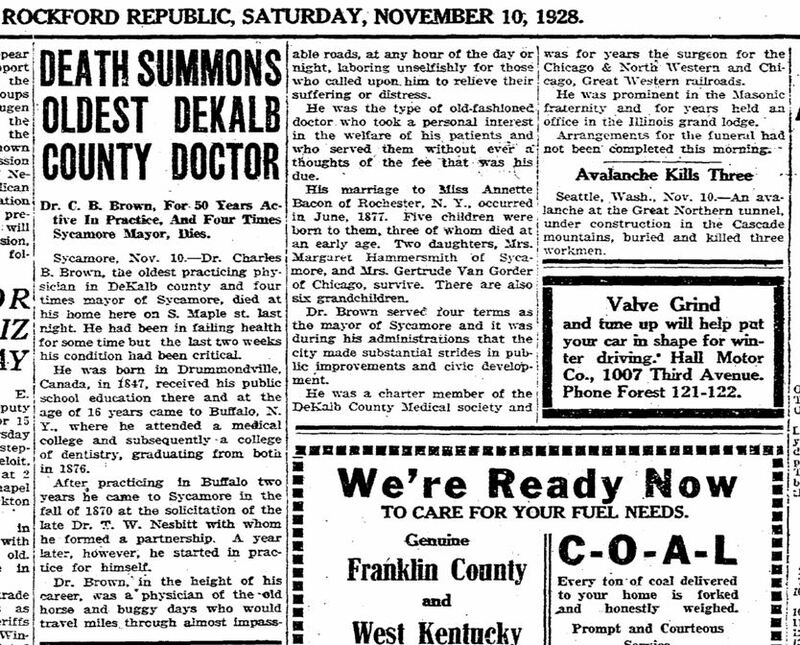 The obituary provided the name of two sons: Edward (the doctor previously mentioned) and Dr. Charles B. Brown of Sycamre, Ill. Charles is well documented in Illinois records, including a death record which named his birth location of Drummondville, Ontario, Canada.4 This was the first time I had a province to work with. Finally with another lead to chase, I worked on Hattie (Harriet) and found she was born in Canada in 1860. With several dozen Edward Browns in Canada in 1861, it was much easier to search for a one-year-old child named Harriet Brown. Thanks to these records, I was able to name the previously unnamed daughters from the obituary and discovered two more children who were already deceased at the time of Edward’s death. 1. Dr. Edward A. Brown, MD was born in 1840 in New York. He was mentioned in his father’s obit as being an early graduate of Long Island College Hospital. I found him listed as alumni in a history of the college. He signed Elizabeth Heriott Brown’s death certificate in 1868 and appears in the 1868 and 1869 Brooklyn City Directory as a physician with an address on Skillman. He died in January 1871 at the age of 30 in Woodhouse, Norfolk South, Ontario, Canada, from consumption.11 His profession is listed as surgeon. 3. Josephine W. Brown was born in 1845 in New York. An unsourced file in FamilySearch states her date of birth as 16 June 1845. She was found on the 1861 Canadian Census in Stanford, Welland, Canada West with her family. She married George N. Smith on 23 Jun 1868 in Norfolk, Ontario, Canada.19 George was born in 1844 in Wales, the son of David and Mary (Williams) Smith. They moved first to Wisconsin before settling in Utica, Oneida, New York, where they remained until their deaths. George died in 1883 and Josephine in 1896.20,21 They had 4 known children: Harriet B. b. 1868, Alice C. b 1870, Arthur b.1874, and Josephine b.1877. 4. Dr. Charles Benjamin Brown was born 25 Dec 1847 in Drummondville, Ontario, Canada and died 9 Nov 1928 in Sycamore, DeKalb, Illinois. He was found on the 1861 Canadian Census with his family. He states his immigration year as 1864, but he was on the 1871 Census of Canada with his family, and his stated occupation at that time was dentist. The Directory of Deceased American Physicians, 1804-1929, states he attended the State University of New York at Buffalo School of Medicine: University of Buffalo School of Medicine, 1876.22 He married Annette Bacon (1850-1915) in about 1877 and relocated to Sycamore, DeKalb, Illinois in 1878 where he remained. According to the article in the paper, they had five children together – I know of four: Stella Brown 1879-1879, Edward B. Brown 1882-1884, Marguerite Brown 1884-1974, and Helen Gertrude Brown 1888-1954. 5. Elizabeth Brown was born in Jan 1850 in Ontario, Canada and died 7 May 1908 in Brooklyn.23 She was found on the 1861 Canadian Census in Stanford, Welland, Canada West with her family. She married William Mason (1834-1903) on 18 Jan 1870 in New York.24 The newspaper excerpt stated “Elizabeth, daughter of Edward Brown of Port Dover, Canada.” William Mason (1834-1903) was the son of John Mason and Harriet Ann Bull and was also the nephew of William Mason (1805-1873) who had been married to Edward’s sister Sarah. She stated 1870 as her immigration date on the 1900 census. Elizabeth died 7 May 1908 and was buried in the Mason family plot in Cypress Hills Cemetery. Elizabeth and William had seven known children: Harriet Ann L. 1871-1953, Anna M. 1873-1908, Frederick W. 1875-1900, Edward 1877-1877, Dora G. 1877-?, Nellie Daisy 1879-?, and John D. 1882-1913..
6. Annie S. Brown was born about 1852 in Ontario, Canada. She was found on the 1861 Canadian Census in Stanford, Welland, Canada West with her family. She is on the 1871 Census of Canada (age 19) with her family. I was not able to locate a marriage or death record for Annie. Based on her father’s obituary (4 surviving daughters) I know she is still alive in 1906, but do not know who she married..
7. Emma F. Brown was born about 1856 in Ontario, Canada. She was found on the 1861 Canadian Census in Stanford, Welland, Canada West with her family. She is on the 1871 Census of Canada (age 15) with her family. Once again, I found no marriage or death record for Emma. Based on her father’s obituary (4 surviving daughters) I know she is still alive in 1906, but do not know who she married. 8. Harriet “Hattie” L. Brown was born Apr 1860 in Ontario, Canada, and died 12 May 1956 in Madison, New Haven, Connecticut.25 She was found on the 1861 Canadian Census in Stanford, Welland, Canada West with her family. She is on the 1871 Census of Canada (age 11) with her family. She immigrated to the US in 1880, settling in Brooklyn. On 6 Jan 1884 she married George W. Knox (1854-1935) in Brooklyn26 and they remained there through 1915. By 1920, she and George had relocated to Connecticut along with her son. She was interred in West Cemetery with her husband George.27 She had two known children: Chester A. Knox, 1885-1966, and Emma J. Knox, 1887-?. Annoyingly, I still don’t know who Annie and Emma married so the most I can say is that they died after 1906. 1. “Edward Brown,” Brooklyn Daily Eagle, 12 Apr 1906, p. 3, col. 1; digital images(accessed 10 Nov 2015). 2. 1900 U.S. census, population schedule, Brooklyn Ward 23, Kings, New York, enumeration district (ED) 386, p. 2A, dwelling 17, family 32, Edward Brown, Oct 1819, 80, England, with daughter Elizabeth Mason; digital images, Ancestry (accessed 17 Nov 2015); citing National Archives and Records Administration microfilm T623, roll 1060. 3. 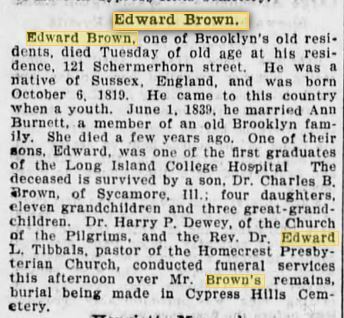 “BROWN-On Wednesday, June 2, ANN BURNETT, wife of Edward Brown.,” Brooklyn Daily Eagle, 3 Jun 1897, Thursday, p. 7, col. 2; digital images(accessed 17 Nov 2015). 4. “Illinois, Deaths and Stillbirths Index, 1916-1947,” database, Ancestry.com (accessed 17 Nov 2015), Chas Benjamin Brown, birth 25 Dec 1847, Drummondville, Ontario, Can, death 9 Nov 1928 Sycamore, DeKalb, Illinois, Physician, Edward Brown, Ann Burnette, Sussex England, spouse Annette Bacon. 5. Mary Ann Walder Brown, Will dated 3 Dec 1901, Probate 16 Nov 1904 New York Wills and Probate Records, Ancestry.com; digital images(accessed 17 Nov 2015). 6.1861 census of Canada East, Canada West, New Brunswick, and Nova Scotia, Stamford, Welland, Canada West, Canada, district 5, Township of Stamford, p. 57, Brown: Edward 42, Ann 48, Edward A. 21, Robert S. 17, Josephine 16, Charles B. 14, Elizabeth 12, Annie E. 9, Emma F. 5, Harriet I. 1; RG 31; digital images, Ancestry.com (accessed 10 Nov 2015). 7 1871 census of Canada, district 11, sub-district d, Woodhouse, Norfolk South, Ontario, p. 53, dwelling 205, family 207, Edward 51 England Baker, Anne 51 England, Charles 23 O Dentist, Annie 19 O, Emma 15 O, Hattie 11 O; RG 31; digital images, Ancestry.com (accessed 17 Nov 2015). 8. 1880 U.S. census, population schedule, Providence, Providence, Rhode Island, enumeration district (ED) 38, p. 93C, dwelling 145, family 240, Brown, Edward 60 England Carerer, Ann 60 England, Hattie 20 Canada; digital images, Ancestry (accessed 17 Nov 2015); citing National Archives and Records Administration microfilm T9, roll 1212. 9. “New York, New York, Death Index, 1862-1848,” database, New York, New York, Death Index, 1862-1848 (accessed 12 May 2014), Edward Brown, age 86, died 10 Apr 1906, Kings, Cert #7367. Cit. Date: 12 May 2014. 10. Cypress Hills Cemetery (Brooklyn, Queens, New York), Plot Records, Edward Brown, interred 12 Apr 1906, grave 17, Sec 2, Lot 161, Brown-Frith family plot. 11. 1871 census of Canada, district 11 Div 01, sub-district D, Woodhouse, Norfolk South, Ontario, Canada, p. 1 Death Returns, Line 20, Brown, Dr. E.A., 30, Presb, born United States, Occupation Surgeon, Unmarried, died January 1871, Consumption; RG 31; digital images, Ancestry.com (accessed 10 Nov 2015). 12. 1871 census of Canada, district 19 division 02, sub-district J, Stamford, Welland, Ontario, p. 88, dwelling 337, family 353, Brown, Robert 27, US Presby, Baker; Eliza 28 Ont Presby; Charles 5 Ont Presby; RG 31; digital images, Ancestry.com (accessed 12 Nov 2015). 14. 1900 U.S. census, population schedule, Kansas City Ward 8, Jackson, Missouri, enumeration district (ED) 80, p. 7B, dwelling 86, family 169, Brown, Robert S. Jun 1843 56 m24 NY Baker, Jane Oct 1847 52 m24, 3/2 children England, imm 1876, Lloyd E.M. Jun 1889 10 Kansas; digital images, Ancestry (accessed 12 Nov 2015); citing National Archives and Records Administration microfilm T623, roll 863. 15. Kansas, population schedule, Leavenworth, Leavenworth, Kansas, p. 1, KS 1885 72, dwelling 8, family 10, line 16, Brown, Robert S 40 Baker, J.C. 37, Limmer W.L 19, Limmer Geo L 17; digital images, Ancestry(accessed 12 Nov 2015). 16. Kansas, population schedule, Leavenworth, Leavenworth, Kansas, p. 4 Roll v115 76, dwelling 573, family 585, line 3, Brown, R.S. 52, Lloyd 6, J.C.54; digital images, Ancestry.com (accessed 12 Nov 2015). 17. “Leavenworth County Cemetery/Burial Database,” database, Leavenworth County.org ( accessed 12 Nov 2015), Brown, Robert S. 1844-8 Nov 1901, Mount Muncie Cemetery. 19. “Ontario, Canada, Marriages, 1801-1928,” database, Ancestry.com (accessed 10 Nov 2015), 23 Jun 1868, Josephine N. Brown, 23 US, George N. Smith 24 Wales. 20. Find A Grave, digital images (findagrave.com: accessed 12 Nov 2015), Memorial #112030890, George W. Smith, b. 1843 d. 1883, Forest Hill Cemetery, Utica, Oneida, New York. 21. Find A Grave, digital images (findagrave.com: accessed 12 Nov 2015), Memorial #112030775, Josephine W. Brown Smith b. 1845, d. 1896, Forest Hill Cemetery, Utica, Oneida, New York. 23. “New York Death Records,” database (accessed 17 Nov 2015), Cert #9329, Elizabeth Mason b. 1850, died 7 May 1908 Brooklyn, 58, Widowed, buried 10 May 1908 Cypress Hills, Edward Brown, Ann Burnett. 24. New York Marriage Newspaper Extracts, 1801-1880, (Barber Collection), “Rev Hiram Hutchings: William Mason of City to Elizabeth Brown dau Edward of Port Dover Canada,” Tuesday, 18 Jan 1870; digital images(accessed 17 Nov 2015). 25. “Connecticut Death Index, 1949-2012,” database, Ancestry.com (accessed 19 Nov 2015), Harri L. Knox, death 12 May 1956, age 96, spouse Geor, State File #08188. 26. “New York, New York, marriage Indexes 1866-1937,” database(accessed 19 Nov 2015), Certificate #53, 6 Jan 1884 Hattie Brown and George W. Knox. 27. Find A Grave, digital images (findagrave.com : accessed 19 Nov 2015), Memorial #130490469, Harriet L. Knox, Apr 1860 Ontario Canada, 12 May 1956, Madison, New Haven, Connecticut, West Cemetery. I honestly have no idea what makes me focus on any particular person in a family, but it frequently happens. I always try to work the family as a group. So I worked by great-great-grandparents Frances Brown and William Frith along with with their children. Then I move back and worked Frances’s parents and her siblings. While it’s a great genealogical technique to develop more information (children’s birth and death certificates often provide middle and maiden names), it can lead to strange emotional attachments. My usual plan is to look at the siblings, figure out who they married and then simply try to establish who their children were. I rarely dig too deeply into all the kids and their marriages, but sometimes, especially on these older families, I get caught up in them. Before I know it, I’ve spent a week trying to figure out the maiden name of my second great grandmother’s nephew’s wife or who the parents were of her niece’s husband. Collateral family can be just as contagious as ringworm. Some of Frances Brown Frith’s siblings passed quickly across my desk without much information to help my search. The fact that there was a family plot helped tremendously when dealing with a family named Brown in New York City and Brooklyn in this era. Determining which William Brown or James Brown was ours often came down to who disappeared after one of them wound up in the plot. Three of Frances’s siblings drove me to distraction as I worked through the list of ten. I simply couldn’t let these three kids or their families go until I chased them down. Sarah – the oldest, Edward – the disappearing, and Mary Anne – the caretaker. I’ve spent a ton of time on them because they wouldn’t let me walk away. I’m going to tell you all I know and believe about these three because that always seems to be how I find out more. First up – Sarah Brown Mason – the oldest. She was born in 1811 in Sussex, England. As with most of her siblings, I haven’t yet found a christening record for her. She and her siblings are on the top of my research list when I go to Salt Lake City this spring. She married William Mason in St Nicholas Church, Brighton on 19 Sep 1830.1 William was born about 1805 in Lewes, Sussex, England and worked as a coach maker or coach trimmer. They, along with their two small sons, William born 1831 and Henry born 1834, immigrated to New York on the Henry Thompson with her parents and siblings and arrived on 11 Apr 1835.2 I did not find a William Mason on the 1840 Census that fit the known family parameters, but that’s not uncommon for that census record. Sarah died about 1849 and was interred in Cypress Hills Cemetery on 14 Jan 1849.3 Based on her listed age at death (38) and her birth year from the passenger record, it is probable that her death prompted the timing of the relocation of her siblings. She shares grave 17 in lot 161, Sec 2, with two of her siblings. The search should have ended there – daughter born, died, and burial location noted. But I couldn’t leave it alone. What happened to her husband and children? Why the hell couldn’t I locate William and his sons on the 1850 Census? If they were dead that soon then they would have been in the family plot, so they had to still be alive. It annoyed me that I was struggling to locate them five years ago, so when I revisited the family this year I went into “Break out the coffee and energy bars – it’s now a quest! !” mode. I believe that their youngest child Henry probably died very young. I found no evidence of him after his arrival and he’s not in the family plots. It is possible he left home and went west, but I simply can’t tie anyone I’ve found to this family. As is often the case, I only found William Mason Senior after I quit searching for him and switched my focus to Junior. I have no idea why this happens when the two men have the same name, but sometimes the Search Gods just like to mess with me. Truthfully, I thought they might have left New York after Sarah’s death and even looked at the possibility of them returning to England. But then I found a U.S. Passport Application for William Mason of Brooklyn, New York, who had been born 13 Dec 1831, is Lewes, Sussex, England4 – the same location that one of Sarah’s brothers had claimed as his birth location. In the details, William Mason stated he’d arrived aboard the Henry Thompson in March 1835 (close enough) and that he’d been a resident of the New York since his arrival. That record led me to many other records, and I was finally able to trace some of his father’s records through him. I worked completely through William Junior’s life (and his children) before going back to his father. I was only able to locate some records for Senior based on the information found on Junior’s documents. I believe that William Senior and Sarah’s youngest child Henry died very young. I have found no evidence of him after his arrival and he’s not in either of the family plots. William Senior and Junior did remain in New York City and Brooklyn after the death of Sarah. While I still have not yet located them on the 1850 Census, I did find them together on the 1855 New York State Census.5 Senior appears to be married to a woman enumerated as Barbery A. born about 1819 in England, who states she’s been in the city one year, placing their marriage date around 1854/55. I have found no other record for her yet. I presume she passed away prior to his next marriage. I did not find Senior in 1860 or 1870, however I did locate him on the 1865 New York State Census6 – God bless those mid-decade census records. By 1865, Senior is 60 years old and married to Ann who’s born about 1824 (19 years younger than him) from England and there is a six year-old daughter named Alice. Truth be told, I hadn’t found William until I searched for Alice after learning of her existence when she showed up with William Junior on the 1880 Census named as his sister.7 That didn’t help for the 1870 Census though as I haven’t located Alice or William Senior yet. Because I haven’t found William or Alice in 1860 and have not yet found any marriage records for William or a birth/christening or marriage record for Alice, I can’t be sure whether she is Ann’s daughter or if she was Barbery’s. William Senior was found in Junior’s family plot in Cypress Hills Cemetery. He died 15 Jul 1873 in Brooklyn and was interred on 17 Jul 1873.8,9 Once I had the family plot records with the interment date, I was able to locate William in the FamilySearch death records. Now that I have a certificate number, I’ll look for the image of his death record when I’m in Salt Lake City to see what other information it may contain. Neither Barbery nor Ann were interred with him in this plot. Nor have I been able to figure out what became of Alice after 1880. I found no will or probate records for William Mason Senior, nor did I find a death notice or obituary for any of them. On 22 Mar 1892, at the age of 60, Junior married Margaret “Maggie” E. Heulls (1855-? ).11 Maggie appears to have been his housekeeper for many years and appears on several census records with the family. Junior died 22 Jan 1895 in Brooklyn, Kings, New York. He was interred in Cypress Hills, in Sec 17, E-1/2, Lot 78, grave 2, with his first wife and 6 of his children.12,13 At the time of his death 4 of his daughters were still alive and 3 contested his will, which left everything to his 2nd wife Margaret. The will was upheld as valid. The probate file is available on Ancestry. 1. Marriage Record, Sara Brown to William Mason, 19 Sep 1830, Family Search. Cit. Date: 9 Jun 2014. 2.”New York, Passenger Lists, 1820-1957,” online images(accessed 12 May 2014), manifest, Henry Thompson, 11 Apr 1835, William Brown and Family. Cit. Date: 12 May 2014. 3. Interment Records, William Brown Family Plot Lot 161, Sec 2, Cypress Hills Cemetery, Sarah Mason, age 38, interred 14 Jan 1849 at the same time as her brothers John and George. 4. “U.S. Passport Applications, 1795-1925,” database and images, Ancestry.com (accessed 9 Nov 2015); William Mason born 13 Dec 1831, Lewes, Sussex, England, arrived 1835, a resident of New York City and Brooklyn since arrival, appliction dat 5 Apr 1892, Brooklyn, Kings, New York. 5. 1855, New York, population schedule, New York City, Ward 20, New York, New York, p. E.D.2, family 614, line 19, William Mason 50, Barbery A. Mason 36, William Mason 24; digital images, Ancestry(accessed 10 Nov 2015). 6. 1865 NewYork State Census, Brooklyn, Ward 9, Kings, New York, p. 44, family 288, line 9, William Mason 59, Ann Mason 41, Alice J. Mason 6; digital images(accessed 10 Nov 2015). 7. 1880 U.S. census, population schedule, Brooklyn, Kings, New York, enumeration district (ED) 238, p. 418B, dwelling 171, family 192, Wiliam Mason 45, Isidor Mason 18, Louise A. Mason, 18, Ida Mason 16, Alice Mason 20; digital images, Ancestry (accessed 10 Nov 2015); citing National Archives and Records Administration microfilm T9, roll 856. 8. “New York Death Records,” database(accessed 10 Nov 2015), William Mason, 15 Jul 1873; citing Death, Brooklyn, Kings, New York, United States, New York Municipal Archives, New York; FHL microfilm 1,323,704. 9. Cypress Hills Cemetery (Brooklyn, Queens, New York), Plot Records, William Mason Sr., interred 17 Jul 1873, E 1/2, Lot 78, Sec 17.. Cit. Date: 10 Nov 2015. 10. England, birth certificate for William Mason, Son of William and Sarah Mason, born 13 Dec 1831; Lewes, Sussex, England registration district, Non-Comromist and Non-Parochial Registers, 1567-1970, Piece 4674: Dr Williams’ Library, Index to Birth Certificates, 1828-1837 sub-district. Cit. Date: 9 Nov 2015. 11. “New York, New York, marriage Indexes 1866-1937,” database(accessed 13 Nov 2015), Certificate #1039, William Mason to Margaret E. Heulls 22 Mar 1892, Kings. 12. “New York, New York, Death Index, 1862-1848,” database, New York, New York, Death Index, 1862-1848 (accessed 10 Nov 2015), William Mason, age 63, died 22 Jan 1895, Kings, Cert #1701. 13. Cypress Hills Cemetery (Brooklyn, Queens, New York), Plot Records, E 1/2, Lot 78, Sec 17, William Mason, interred 27 Jan 1895, grave 2.